Diatomaceous earth, sometimes referred to as “DE,” is a natural substance that is actually created from the remains of diatoms, microscopic water plants that are like algae. It contains such minerals as silicon, calcium, sodium, and magnesium. It has a consistency similar to talcum powder and is available at most garden suppliers. This is a remarkable substance that is a desiccant – it actually dries out the waxy outer layer of fleas so they dehydrate and eventually die. As an added benefit, diatomaceous earth can eliminate other insects. So yes, in some respects, it is a miracle cure for fleas. It’s a product we’re pretty proud of, and consider to be worth the investment in the long term, in the same way you’d invest in insulation. Never having to worry about fleas working their way deep into your home is a comforting thought for those with pets who love the outdoors. But even though diatomaceous earth is a natural substance, its dust is dangerous to breathe for both humans and animals. Using it requires gloves and a dust mask. Be certain to read any cautions that come with the product and use it only as directed. Outside the home, spread it around the foundation and entry points. Inside the home, spread it around windows, doorways, and baseboards and rub it into the carpet. If you use this method, always use gloves, a dust mask, and goggles, and leave the house for several hours after use. It is not safe to inhale this substance when any particles are floating in the air. Fish, birds, and animals should not be left in the house. When you return, vacuum thoroughly. Some people spread diatomaceous earth directly on their pets, essentially using it as a flea powder. If you do this, be aware of the potential risks. Since it is a drying agent, diatomaceous earth can dry out your pet’s skin. It can also be irritating to the eyes and lungs. Make sure you are using “food grade” diatomaceous earth if you want to try it on your pet. Watch the accompanying video for an interesting if lengthy explanation of diatomaceous earth. 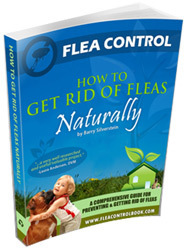 Diatomaceous earth is one of the natural substances discussed in Flea Control: How to Get Rid of Fleas Naturally. I used DE on my cats and the carpet and did not know about the breathing the dust til after I found this article. I purchased it at a Health food store and they didnt tell me how long to leave it on the carpets or to be careful not to breath the dust. I put it on my cats and dust was flying everywhere. I think I put too much of it on my carpet also. I hope I will not get sick, or my cats eiher. I dont know what to do can you help? … I know the obvious response is to ask the cashier but they didn’t seem to know anything about the product! You are going to love this stuff. We are always being attack in our garage. The fleas didn’t stand a chance and only after applying 1/2 hour later, instant results. After all these years of hassle, finally I’m so happy. Never again would I use anything different, just amasing! Thank you, Thank you! I have an infestation & do not have carpeting; wood floors & tile. I got rid of the area rugs back in June & now it is October. We still have fleas. Frontline was about to send Terminix to our house to treat the infestation, but the technician told us they do not treat non-carpeting. What about the furniture. No. So now I am looking to get the DE. However, how do I treat the floors if there is no carpeting? And what about treating the furniture with the dust? How does one eliminate fleas from the furniture with DE? my question is how often can I put DE on my dogs? I applied some yesterday and today they are still full of fleas. Im going to try this DE stuff because I had a kitten given to me by someone and I let it sleep in the bed with me and after about 3wks I was bitten all over my body, first thing I throught was bedbugs and had the apt exterminator come out and couldn’t find not one bed bug and looked @ me like I was crazy. I didn’t think of fleas because the kitten never been outside except on my screened in porch(unless the fleas jumped through the screen) anyway one day I caught a flea on me while he was biting me and it hopped right out of my hand. So now Im having a flea war in my house, I bombed twice and I have the dish detergent in a bowl with lamp over it which I have seen a number of fleas in it over the past few days. I panicked and gave the kitten away because of all the bites on me I didn’t want anymore but I did bathe the kitten in dawn before giving her away. I still have fleas in my apt but not as many as I had before I realized what the problem was so it could have been worst if it was bedbugs. None found as of yet. Hope this DE works for the left behind fleas! DON’T USE CITRUS ANYTHING ON CATS. It can kill them. Check with your vet before you treat a cat with anything. They are adversely affected by topical preparations that won’t hurt dogs. Diatomaceous earth is so named because it’s mined from ancient deposits of the fossilized hard-bodied skeletons of a sea algae, and neither you or your pet needs to be breathing the dust. DE kills insects by abrading their exoskeletons. You don’t want it settling permanently in your lungs. Or your pet’s. DE has almost universally glowing reports about its positive effects, and that alone should trigger the suspicion that True Believers are leaving out any drawbacks. Nothing is completely beneficial. DE is less harmful than pesticides, but you want to know the down side. For instance, if it’s really completely harmless, why don’t sell it in their offices? I bought 24oz of the food grade, but I’m waffling about dusting my animals and their bedding with it, just because of the inhalation problems. I think I’ll put it on the yard, though. To you unhappy flea-ridden Floridians, I used to live in Florida. I doubt Florida canompete with suburban Houston for tick infestation. And I’m beginning to wish I were back in Phoenix, too.